The childhood home of one of the Philippines' greatest national heroes. Without going to much into a history lesson; José Rizal was a very intelligent Filipino that lived during the late 1800s. He was ultimately executed by the Spanish for the crime of rebellion; Rizal was a leading force and influence during the Philippine Revolution, that ultimately led to the Philippine Independence, on September 29, 1898. José Rizal was born on June 19, 1861, in a original two-story Spanish colonial house in Calamba, Laguna. During WWII, Rizal's original house was destroyed, but was rebuilt at the same site on June 19, 1950. With Rizal's original belongings kept intact inside the shrine, visitors can roam the house freely. Original and relevant trivia are written on the walls and the rooms are carefully reconstructed and presented the way they used to be when José Rizal used to live there, in the late 1800s. Rizal's original belongings are kept intact, and the rooms are playfully replicated, with interesting trivia written across the walls. The shrine has a large lawn with a replica of a nipa hut Rizal used to play with his sisters in. Next to the hut is a statue of a young José Rizal, with his dog. This statue was constructed in 1996 for the centennial celebration commemorating Rizal's death. A statue of a young José Rizal with his dog is present in the garden of the house. Even though al of the rooms were carefully reconstructed the way they used to be back in the late 19th century, there's one feature of the house that is still from the original house. The old well, next to the dining room, has survived the World Wars, and has now become a 'wishing well' for the José Rizal Shrine's visitors. Noteworthy is also that about 20 meters away from the old 'wishing well', the remains of José Rizal's parents (Francisco Mercado and Teodora Alonzo) are buried in the garden, next to a narra tree. The remains of José Rizal's parents are buried in the garden of the house. The house itself, which is really a typical 'bahay na bato' (literally meaning 'house of stone' in Tagalog); a typical upper-class house built during the Spanish colonial era, was designated as a National Shrine (Level 1) by the National Historical Commission of the Philippines. Even though it's just a replica of the original house that got destroyed during WWII, it still holds a very special place in many Filipinos' hearts, and ever remains one of the most frequented historical sites in the Philippines. The José Rizal Shrine remains one of the most frequented historical sites in the country. The Rizal Shrine is in the middle of Calamba City and easily accessible along Mercado Street and Rizal Street. Another fact is that the Rizals where also known by their other surname 'Mercado', hence the site is located at the crossing of Mercado Street and Rizal Street. The Rizal Shrine actually holds no entrance fee, but donations are accepted and appreciated. The house is open from Tuesday to Saturday, 8:30 am to 12:00 nn and 1:00 pm to 4:30 pm. 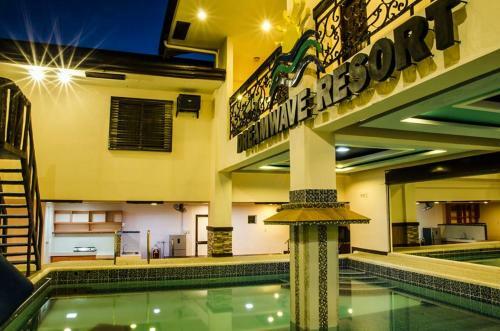 A recommended hotel nearby (0.5 km) is the Dreamwave Resort Pansol Laguna, but for more good deals in the City of Calamba, check out the Booking Dealfinder down below.